330 pages | 410 Color Illus. The new edition of Cattle and Sheep Medicine incorporates over 250 new clinical cases divided equally between cattle and sheep. The cases appear randomly to reflect real life practice and are presented as a set of integrated questions, photographs and detailed explanatory answers—to educate and not just to test. New images have been added for all cases and multiple choice questions are included for revision purposes. This second edition covers important clinical features of a range of common diseases of ruminants encountered in first opinion practice in a problem-based format. The book also contains many diseases not featured in the former edition. While common diseases are also again featured, the situations have been changed to mimic general practice, as a disease does not always manifest with the same clinical features. The diagnosis and treatment regimens described are those used by the author over the past 38 years in commercial large animal practice. They acknowledge the time and financial restrictions that occur in many situations, but require no specialised facilities or equipment. 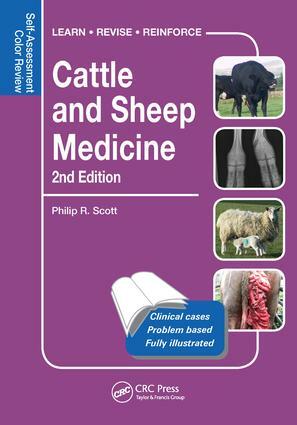 "The book is a useful aid for students and practitioners who are looking to reinforce their knowledge of cattle and sheep medicine and gain experience applying their knowledge to realistic problem-based scenarios"
"… a gem of a book for revision and to reinforce learning – and it is small enough to be popped in a bag or kept in the glove compartment of a car." "There are a number of books that address ruminant health, but they do not have images or the clinical practicality of this book. This is a very useable book for students or entry level practitioners to gain an understanding of common ruminant diseases and their appearance." "… appropriate for self-review in preparation for a viva voce-type examination for undergraduate veterinary students, or veterinary graduates seeking postgraduate recognition, and it could well be of assistance to examiners of those same candidates."